Flower Council Holland. 2010. Me and My Plant. Uitgeverij Snor. £0.00 (hard back/PDF). People form relationships with many biological entities – other people, pets – and even non-biological ones like rocks (well, maybe just in the 1970s? …though they were marketed as living pets, and ‘rock’ is also a plant type per Me and My Plant – p. 9). And those bonds can be very important, especially when one is in a new place and/or starting a new job/career and/or having new responsibilities and/or facing new challenges in one’s life. Thus, Me and My Plant [hereafter reduced to MMP] is ideal for students who face all four of those as they embark on their journey of self-discovery at college or university. Initially they may not know anybody else in their new environment, so a plant ‘someone’ to talk to/confide in can be important in bridging the gap between their former existence probably at home with friends and family and their new life, which can be just a bit lonely at first. And even if they’re not studying biology – or anything else that’s remotely ‘planty’ – their new-found hobby might…err… blossom into a lifelong passion. And it is this idea of companionship – and even passion – that is very much the premise of MPP which likens the caring for a plant as a love affair. Indeed, the 144 paged book’s chapter headings – which are likened to ‘phases’ – read a bit like a script for a ‘romcom’: Falling in love (like many relationships, a few drinks helps lubricate the relationship – though just water in this case! ); Living together (picking the right spot in the new home…); Time for yourself (top tips on how to keep your plant well whilst you are separated…); New Life (all about propagation! ); Enjoying life together (including the secret powers of your plant…); and Growing old together (including diseases and plant pharmacy…). But looking after a plant isn’t ‘just a phase’, it might just be the start of a whole new way of life for you! MMP is full of sage advice on plant care and is littered with fascinating phytological facts and snippets of plant lore. And for the gizmo-savvy student generation of today it also features some gadgets that may appeal, such as ‘tweeting’ plants and a ‘peeing’ robot(!). It also contains proper science stuff, too, but usually without references. So, I’d love to know the references for some of the science that is cited in the book. For example, Helen Russell’s Surrey University work (p. 48) on the stress-reducing effects attributed to plants (very useful in a student context with those assignments to do and exams to study for..?). And Marcel Dicke’s “world famous research” into the interactions between plant and insect (p. 59). Quibbles? Only two. Whilst it is nice to see the shorthand ‘formula’ for photosynthesis included (p. 41): CO2 + H2O + light energy = C6H12O6 + O2, I would like to see the numbers ‘sub-scripted’ as per scientific convention. 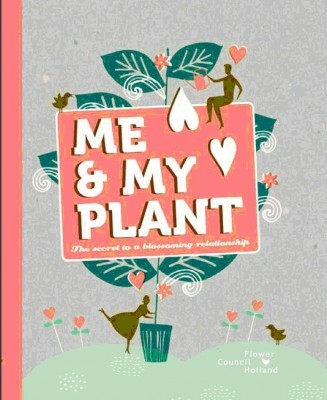 And I have to resist an almost overwhelming urge to correct the book’s title to “My Plant And I”. Competitors? Probably manuals from the highly prolific and respected David Gerald Hessayon’s ‘Expert’ series of ‘looking after plants’ books [http://en.wikipedia.org/wiki/D._G._Hessayon]. But, when you’ve got this lovely – free – tome, there is no real competition.